Zoom on to the open road, well not really. 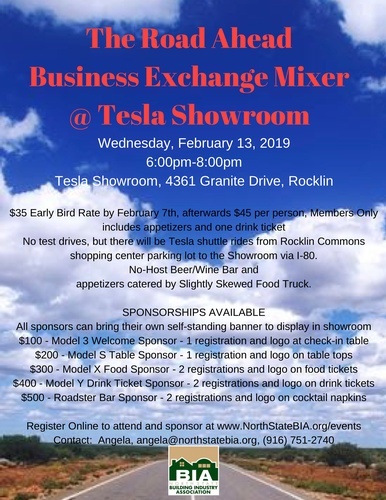 We will be at the Tesla Showroom to mix and mingle at our next Business Exchange Mixer and check out the newest Tesla models. Sorry no test drives, but there will be Tesla shuttle rides from Rocklin Commons shopping center parking lot to the Showroom via I-80. No-Host Beer/Wine Bar and appetizers prepared by Slightly Skewed Food Truck. Sponsor levels range from $100-$500. All sponsors can bring their own self-standing banner to display in showroom. Parking is in the Rocklin Commons shopping center. You can walk or shuttle in a Tesla to the Showroom. Sorry, no test drives. Unless you don't want beer and wine at the event!